How the tribute project is repurposing fashion. Gay Kenney Browne, CEO of @Greenopia. Environmental Entrepreneur. Health Activist. Mom. Thought Leader. I help people lead healthful lives. Hiker. Yogi. #plantbased food advocate. A true fashion stylist is the person who can open the closet and make what’s old new again, who no matter where they go, how casual or formal, they have a knack for always looking fabulous. That person is my friend Jules Allen, founder of Jules Allen Cashmere and co-founder of the Tribute Project. I met Jules when I first moved to Santa Barbara ten years ago. I was at social gathering and someone pointed her out as someone I should know. The funny part of that story is that my friends in LA had already suggested I look her up when I moved, and now there she was. They had all assured me that she was just like me but at first glance I wasn’t sure how. My default dress code is my old worn-out denim jeans, cashmere and clogs and the woman I was introduced to was enviably stylish. But it turned out my friends were right. We both drive back-and-forth to LA every week and have a wide range of friends. We each have one child that is nine years older than our youngest one. We’re both entrepreneurs running our own companies who put a priority on our families and roles as mothers. We love being social but also adore having a place to retreat from it all. Like me, she adores drinking champagne when celebrating, doesn’t wear a lot of make up and doesn’t sweat the small stuff. She loves life and all her friends and doesn’t gossip. We even share the same hairdresser, Art Luna ! Her cashmere pashminas have long been my favorite. I carry one with me at all times and often gift them to my friends, which was my reason for stopping by her house the other day and how I came to learn about her newest endeavor which she just launched online this month with co-founder Dani Stone, called the Tribute Project. As I perused the racks of beautiful jackets that filled her living room, Jules told me the story of how the Tribute Project came to be. Jules and Dani both share a love of music so they decided to create a pair of custom, structured “Balmain-esque” wool blazers as a tribute to one of their favorite bands, Guns N’ Roses. 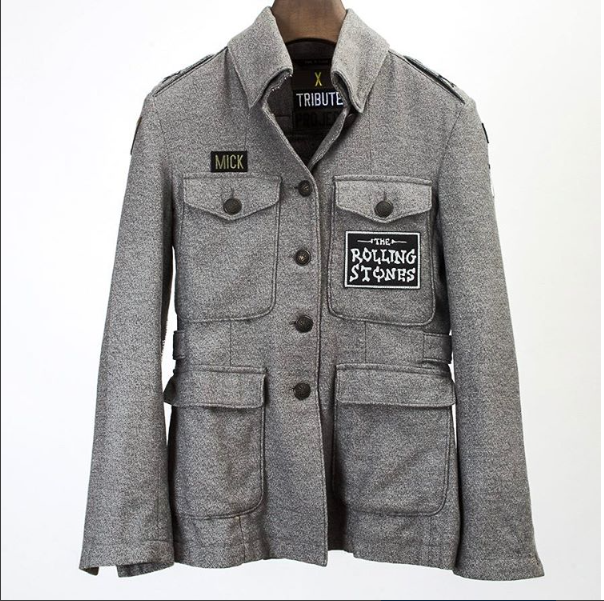 Rather than start from scratch, they carefully deconstructed vintage designer finds and added epaulets and graphic homage to Guns N’ Roses. The result was this distinctive and chic fashion statement that also told the story of their love for the band’s music. As soon as they started wearing them, people wanted to know where they could get one. Word spread so quickly Jules and Dani saw enough of a demand to launch a new business which is how the Tribute Project was born. There is so much I love about what they are doing, especially in an era of “fast-fashion” in which clothes are produced quickly, and trashed even faster, creating all sorts of environmental crisis. Many of us don’t realize that 84% of unwanted clothing in the United States goes into a landfill or incinerator producing toxic greenhouse gas methane as they degrade. That holds true even for natural fibers which often go through a lot of unnatural process to get that way. Synthetic fibers are a type of plastic made from petroleum which means like plastic bottles, they will not biograde. We waste so much in our culture and often forget that the waste includes clothing. But what Jules and Dani are doing is repurposing fashion, many of them vintage finds, and cleverly sewing on patches, artwork and sometimes even lyrics. At a time when clothing is made to not last, they are creating one of a kind works of art that literally have a story to tell like The Beatles Lady Madonna, David Bowie Foreigner, The Clash Bankrobber or Frank Sinatra My Way Blazers. I don’t consider myself a fashionista, but these jackets spoke to me and I wound up treating myself and leaving with two which may seem like a lot, but nothing compared to an earlier customer who Jules told me walked out with fifteen! While refusing plastic and eating organically are very important there’s more than that to living with a green heart, which is another thing Jules and I have in common. It’s about thinking sustainably on every level, and taking something that might look to have no purpose, remembering it too has a story and finding the purpose in it again.